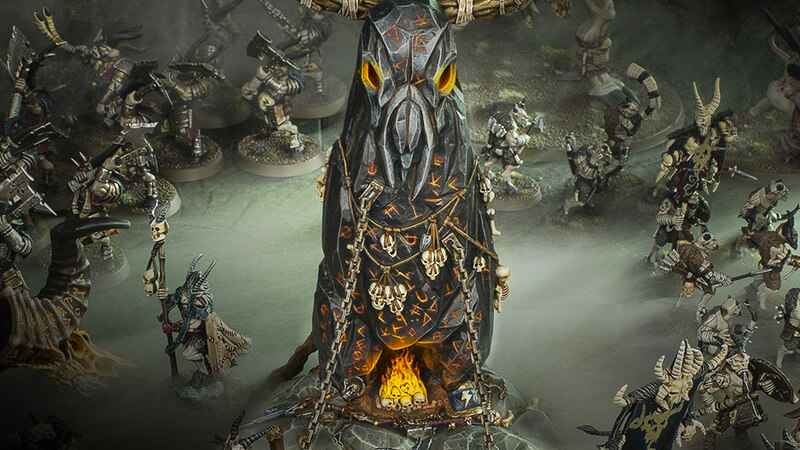 Well, if you’re one of my instagram followers, not only do you have impeccable taste, but you’ve likely already seen the post from last week about being seduced by the lure of the Beasts of Chaos battletome for Age of Sigmar. The musk is obviously heavy with those fine gentlemen. Ahem, anyway. I haven’t played Age of Sigmar in years. In fact, I’ve only played it twice, and that was in its first edition, and I was playing with the new Stormcast Eternals. I did like those chaps, and still have my army from back in the day. At any rate, while I’ve made no real move to do anything more with the fantasy setting of Warhammer, I have been keeping an eye on things, and have often felt myself weakening as regards to getting back into it all. See, Warhammer Fantasy is what got me into this mess in the first place, and I will no doubt always have a soft spot for the Old World, even in its new incarnation. While I was almost won over by the Daughters of Khaine (I did buy a couple of things, but then returned them and bought loads of Tau, instead) and the Idoneth Deepkin (I do actually have a box of something from that line, though I’m planning to turn them into Mandrakes for my Dark Eldar army – though I have heard they’re not quite the right scale? Oh, anyway), I’ve always managed to keep myself back from pulling the trigger on getting into Age of Sigmar with a full army. But when the previews started coming out on the Warhammer Community website, I was finding myself increasingly drawn to the Beasts of Chaos, and the idea of once again getting into the whole Fantasy thing, and so I have cautiously begun to dip my toe into the pond on that. Well, we’re probably mid-calf at this point, but I’m digressing. Beasts of Chaos are one of the classic armies from the World that Was, of course, and were incidentally the first army I played against in the AoS system. I remember at the time thinking they looked like great models, and around the same time I bought some Minotaurs (now called Bullgors). I never did anything with them, and I think I ended up selling them. Anyway. With all the new stuff coming for the army, I’ve once again turned my focus to these delightful, hairy chaps, and have decided that here is the army that I’ve been waiting for to get my attention. I’m hearing a lot of good things about Age of Sigmar 2.0, and there has always been a very vibrant Fantasy scene at my local store, so I reckon it’s as good a time as any to start getting properly into this stuff. For the moment, life seems to have settled a little, so I think it’s about time I looked into the other offerings from Games Workshop, and see what they have going on. Endless Spells are something I have no idea about, but they do sound kinda fun, adding another level to the game. I’ve always played armies with no psychic ability in 40k, so magic and the like is something that I’m not 100% sure about. So that’ll be interesting to see where it goes. 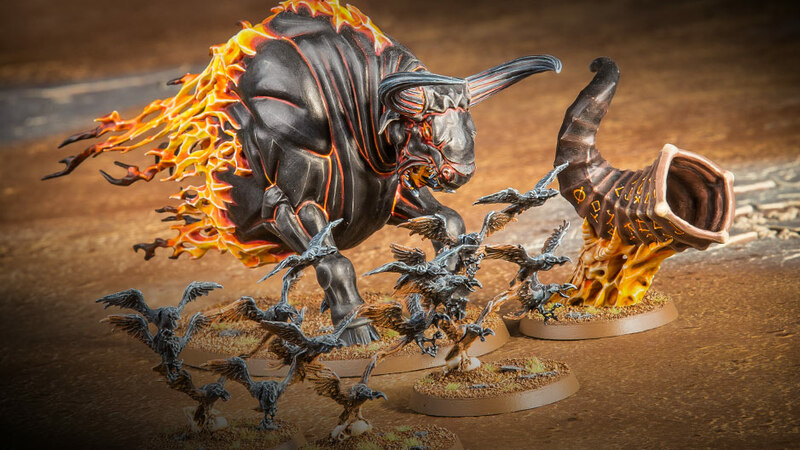 The fact that magic spells have models sounds great, anyway, and the flaming bull and magical horn look tremendous – not so sure on the birds, but they’ll make great Razorwing Flock proxies for my Beast Pack in my Dark Eldar army. 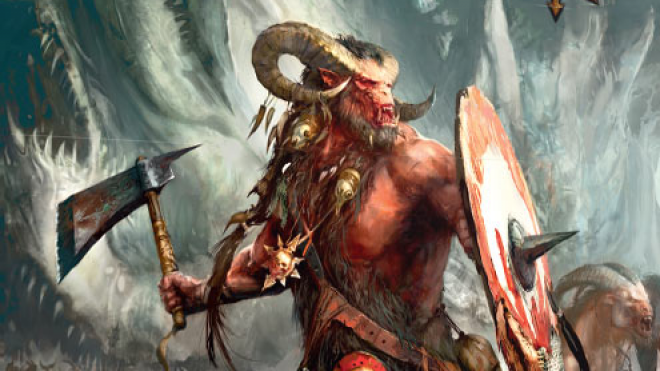 All in all, I’m really looking forward to trying my hand with the Beastmen. I’ve been talking with a mate about Blood Bowl, and we’re both going to give it a go at some point, with a bit of luck. Once again, it’s good to have the sort of game where all you need is one team to get going, so I think it’ll be nice to have something available to use should the opportunity arise. Naturally, I’ve chosen the Doom Lords, although I was also considering the Dark Elves at one point. I have no idea about getting into Blood Bowl, and have only today ordered the box of these chaps, so once I’m sufficiently along with the AoS Beastmen, I think I’ll start to look at the fantasy football team and see where I can go with them, also. Stay tuned for more blogs where I ramble inanely about my adventures with Beastmen, as I get started with both Age of Sigmar and Bloodbowl! I didn’t realise there was such a thing! Thanks man – I’ll have to try it out! I’ve only previously encountered the game through the Team Manager card game Fantasy Flight made (https://spalanz.com/2014/08/05/blood-bowl/) – it was really fun, anyway, so hopefully all these other things will also be as good!